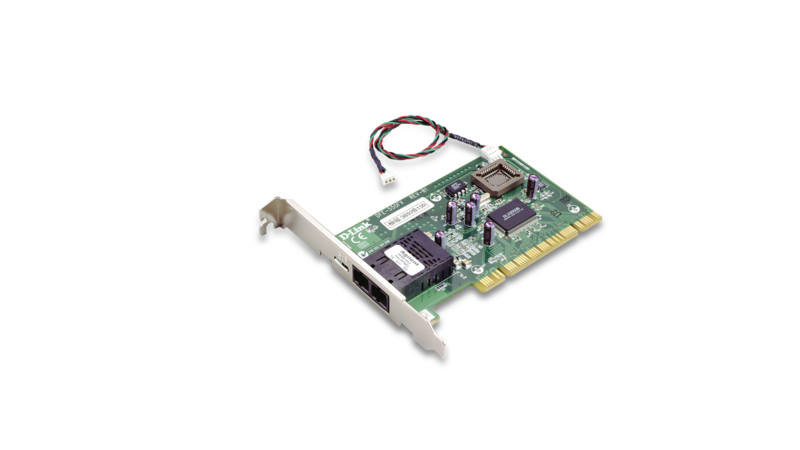 Ideal for workstations and servers, this Optical Fiber Fast Ethernet Card supports advanced features and transfer speeds of up to 200Mbps in full duplex mode. The DFE-550FX is a 100Base-FX Multimode fiber based network card supporting transfer speeds of up to 200Mbps in full duplex mode and cable distances up to 2km. It can be used in either workstations or servers and supports advanced features such as WOL (Wakeon- LAN management), 802.3x Flow control, 802.1Q VLAN support, and 802.1p priority tagging. With 32-bit bus master operation, the DFE-550FX guarantees the highest level of performance. Bus mastering guarantees data is passed directly between the card and the host bypassing the host CPU and reducing added workload and CPU overhead. This in turn improves network and host performance. The DFE-550FX supports Advanced Configuration Power Interface (ACPI) Wake-On-LAN (WOL), which allows your computer to be powered ON/OFF from a remote location. Providing a great utility for power management, this function allows the administrator to send a ‘wake-up’ signal to a computer or server to initiate a power-up sequence. The DFE-550FX supports 802.3x flow control. This provides a means to protect against possible data loss during transmission on the network. When connected to a Fast Ethernet switch that also supports flow control, the card receives signals from the switch regarding buffer overrun during peak usage periods. The card then delays transmission until the switch is ready again to accept new data. The DFE-550FX supports IEEE 802.1Q VLAN tagging, allowing you to segment the network into smaller domains to improve performance and security. The DFE-550FX provides a VLAN table for the following functions: filtering packets by recognizing VLAN Tags, stripping VLAN Tags on receive, and inserting VLAN Tags on transmit. With packet prioritization capability, the DFE-550FX allows traffic to be queued as critical and non-critical, permitting your computer to run Voice over IP (VoIP), video-conferencing/ multimedia applications and other time-sensitive traffic with higher priority than non-critical data. This in turn helps to eliminate jitter and lag in multimedia streams. With RPL (Remote Program Load) and PXE (Pre-boot Execution Environment) support, administrators can choose to set up a security scheme for diskless workstations to boot from. Stations with boot ROMs installed on the on-board socket can boot from NetWare, NT and other servers to run applications designated by the administrator.